This entry was posted on Donnerstag, November 25th, 2004 at 00:00	and is filed under best shots, gallery, landscape, photo friday, travel. You can follow any responses to this entry through the RSS 2.0 feed. You can skip to the end and leave a response. Pinging is currently not allowed. Beautiful play of form and light. Stunning… That’s all I can say. 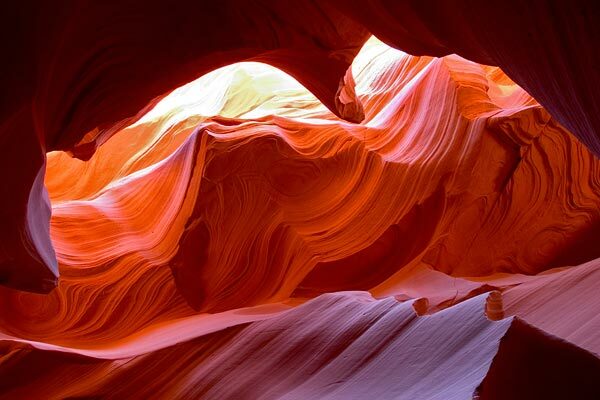 The Antelope Canyon is located near Page (USA) and is one of the greatest places to make pictures. Fantastic exposure! The textures and colors are stunning. Great shot and location. The harsh sunlight and deep shadows make good captures difficult, but this is well done. I really love your photos. This is indeed a great shot. Almost looks like the stone is burning! Wow, that’s an amazing shot. Slot canyons have always amazed me with their sheer beauty. Fantastic lines! Great exposure too! This is fabulous. Infinite number of orange tones. Interesting texture and lighting. Beautiful and inspiring image! Congratulations on the Noteworthy. It truly is deserving. Beautiful image, you’ve captured the light and lines extremely well! This is really stunning. The Way this shot has been taken, deserve appreciation. Wow. This makes me think of a Werner Panton interior from the late 60’s early 70’s.